“The mission is literally about saving people’s lives,” says Jason Eden, an Executive MBA graduate from Bath School of Management, a former Royal Air Force (RAF) pilot, and founder and CEO of wearable technology startup Safr. In the UK alone, 25% of all fatal road accidents are caused by fatigue – that’s around 500 people killed and 46,000 injured each year due to drivers falling asleep at the wheel, losing concentration, or making rash decisions because they’re tired. Launched in June 2016, Safr (Sleep and Fatigue Research) uses wearable tech to track sleep and fatigue, and help people in high-performance, high-consequence industries prevent mistakes and perform to their potential. Jason formed the Safr team with two ex-RAF friends. The current focus is on preventing road traffic accidents – Safr received an early-stage innovation grant from UK Department of Transport. But the cross-industry potential is huge. Jason’s already in talks with the UK’s National Health Service (NHS) and Ministry of Defence (MOD). 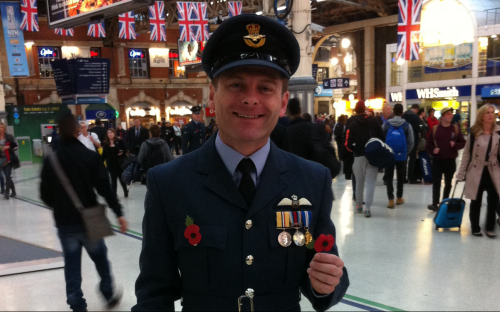 Jason spent 15 years in the RAF as a pilot serving in both Afghanistan and Iraq prior to his Executive MBA. On one long-haul flight, he woke up with a start and walked through the aircraft to find that every member of its 13-man crew, including both pilots, was asleep. It was a formative experience. From 2010, Jason worked as head of risk management and air safety at RAF Northolt, where he designed and implemented a fatigue risk management system for the airfield’s crews and engineers. Ready for a career change, he chose Bath over a number of top UK-based business schools for his Executive MBA. For Jason, it was an integral step on the journey to starting his own business. How did the idea to start Safr come about? I’d been in fatigue management for a long time, and I realized that aviation was very much a leader in the space. I wanted to take that knowledge, expertise, and technology into different industries. Initially, I did my MBA dissertation on the effect of fatigue on financial services. Unfortunately, with the culture of the industry, even though there’s a massive fatigue problem, people aren’t ready to do anything about it. We started thinking about where there was a pressing need, and road transport became the obvious choice. It was an idea that I’d been incubating since the MBA, and everything just came together. We were awarded an innovation grant from the Department of Transport and, at the same time, found a corporate partner to do some trials. We’re UK-focused at the moment, but our scope is global. We’re not looking to build a 500-consultant business. We’re looking to keep a small team with large revenues. We’re exploring many options – not just road transport. We’ve had a meeting with the CEO of NHS Improvement, looking to address fatigue amongst doctors and nurses. We’re talking with the MOD about a possible trial. Ultimately, we’d like to work ourselves into the insurance space. In the same way that you have a telematics device for your car, we want to provide telematics from a person, giving insurers an indication of how someone’s level of fatigue affects the likelihood of having an accident. I wanted to leave the air force while I was still enjoying it. I didn’t want to become the grumpy old guy in the corner whining about how things were better in his day. I wanted to prepare myself for a future career, and try to work out what it was I wanted to do. I thought an MBA would help me with both. I visited a number of schools, but the atmosphere at Bath really clicked with me. I immediately felt comfortable there. Would you be where you are today without the Bath MBA? No! I’ve always had an interest in starting my own business. Doing the MBA gave me the confidence to try. The MBA gave me a broad foundation across all the knowledge sets and skillsets that are needed in running a business. Things like finance and raising funding; I was completely unfamiliar with – I had no idea! The MBA gave me that familiarity so I knew where to start. What do you miss and what don’t you miss about your career in the RAF? It’s an old cliché, but I absolutely miss the camaraderie and the people that you work with. You make friendships in the military unlike any other, because you share such intense experiences. Of course, flying is a lot of fun and you get some amazing opportunities. From dog-sledding across Canada to canoeing down a Swedish river for a week; there are all sorts of things you’d never get the chance to do in another career. What I don’t miss is being shot at! The only job I ever wanted was to be an air force pilot – I wouldn’t swap it for any other. But even when you’re doing something you love, after 15-to-20 years the novelty starts to wear off. You reach a point when it’s time to move on. How does a career in the RAF prepare you for a career in business? People who’ve never been in the military assume it’s all about running around with a gun and shouting! It’s not like that at all; anything that happens in any big organization happens in the military. You get formal training in leading and managing people. You get continuing professional development – most organizations provide none of that for their staff. You get technical skills and you learn to be a generalist as well, because every two and a half years you get a new posting and do something completely different.